This is a handmade and painted porcelain plate by Marie Friedman. 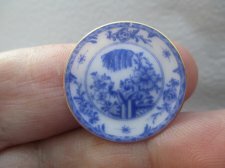 A beautifully decorated blue and white plate. Signed & Dated MF, 1984.